Astrolux started as an in-house budget priced brand at Banggood. 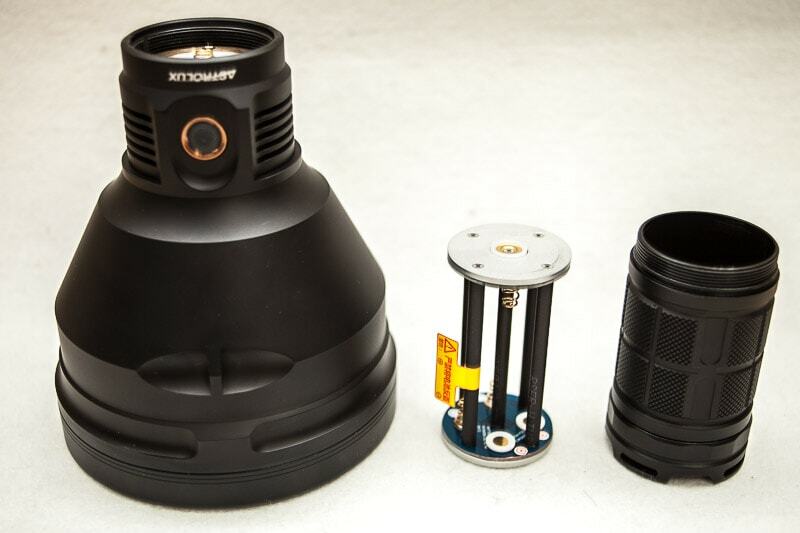 Their line up has expanded rapidly with the Astrolux MF04 being the latest as their monster thrower. 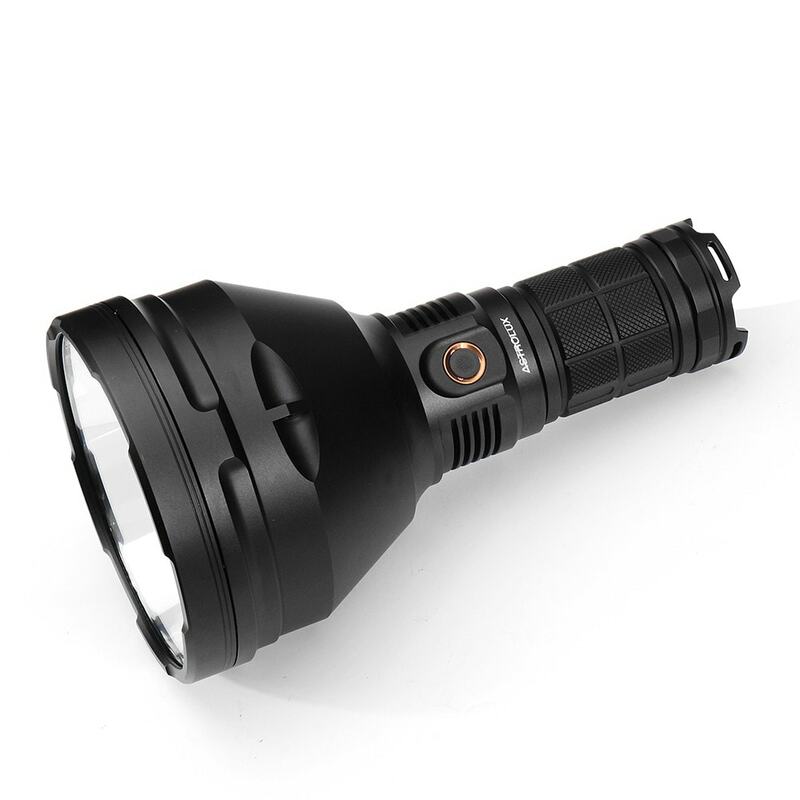 Throughout the review I will talk about the Atrolux MF04, but it is the same light as the Mateminco MT35 Plus. 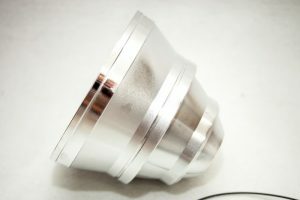 From specs this is going to go after the BLF GT that I also reviewed. 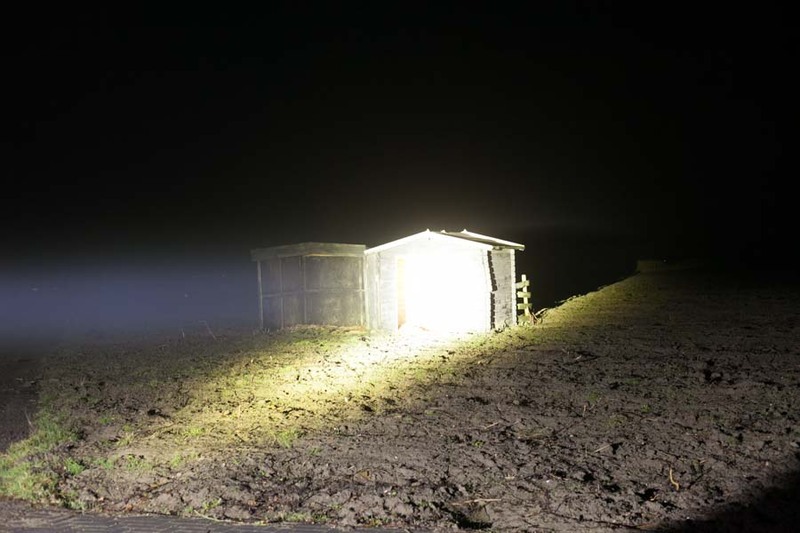 The MF04 is going to be a very interesting competitor when it comes to long-range flashlights. 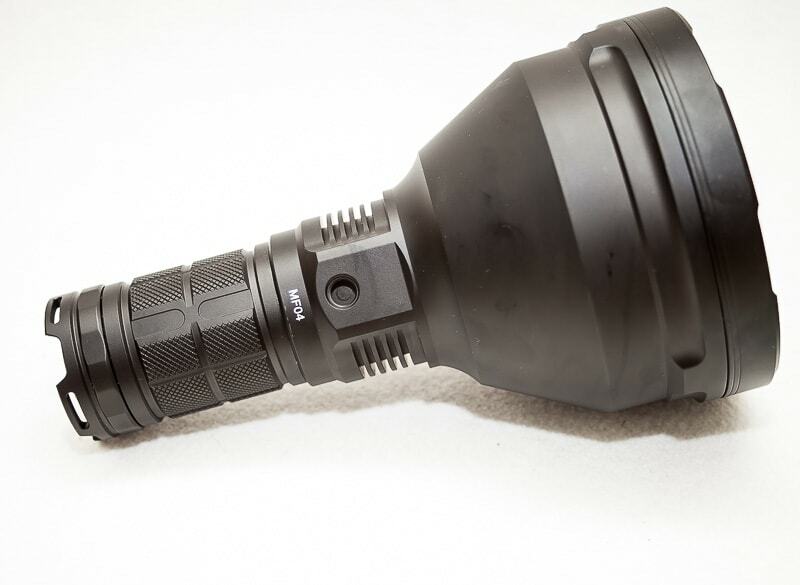 I, and many others, have been looking forward to this extreme far reaching flashlight since it was announced. It is supposed to reach as far as the BLF GT, but then at a lower price. After waiting for 2 months for shipping I finally received it, after paying $60 on import taxes. Here in the Netherlands we have strict import rules, and this one didn't get throught it, even the invoice said it was valued at $60..... so I paid the same for import fees and taxes. 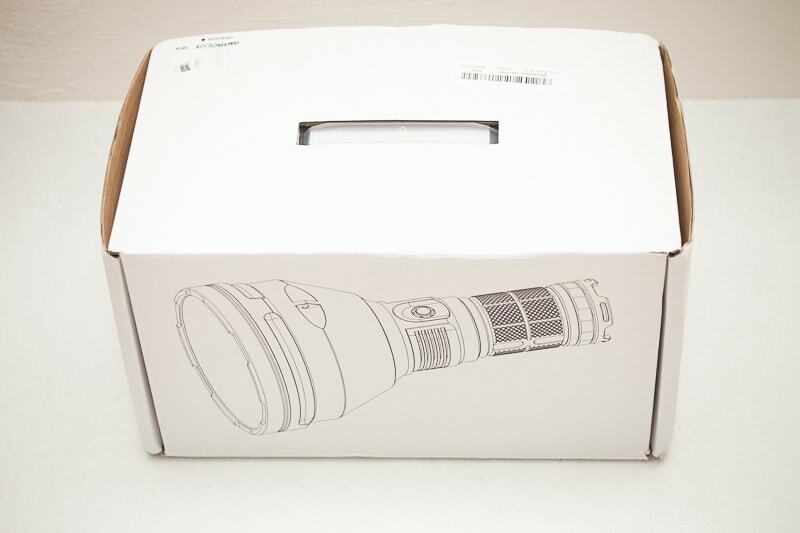 But nevertheless I finally received the flashlight. Inside a carton box with enough padding. 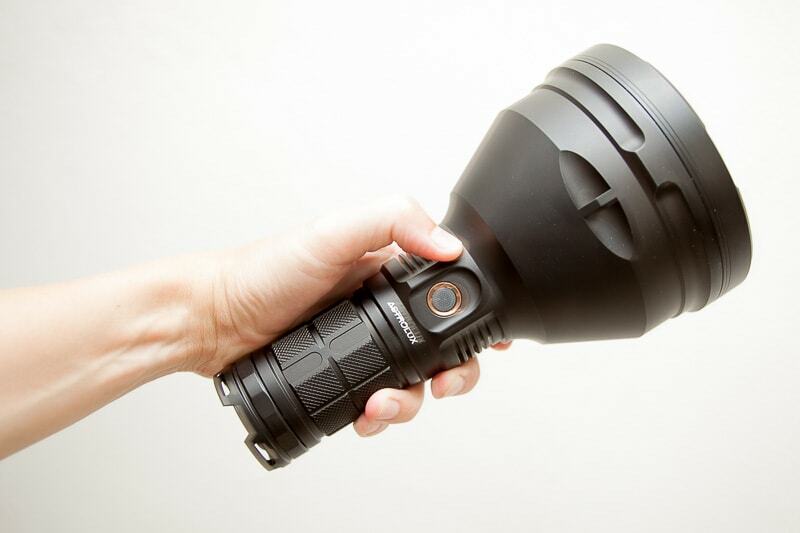 Keep in mind that this is not an EDC flashlight LOL. 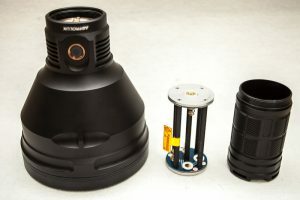 The body seems to be a little off-balance compared to the longer BLF GT. 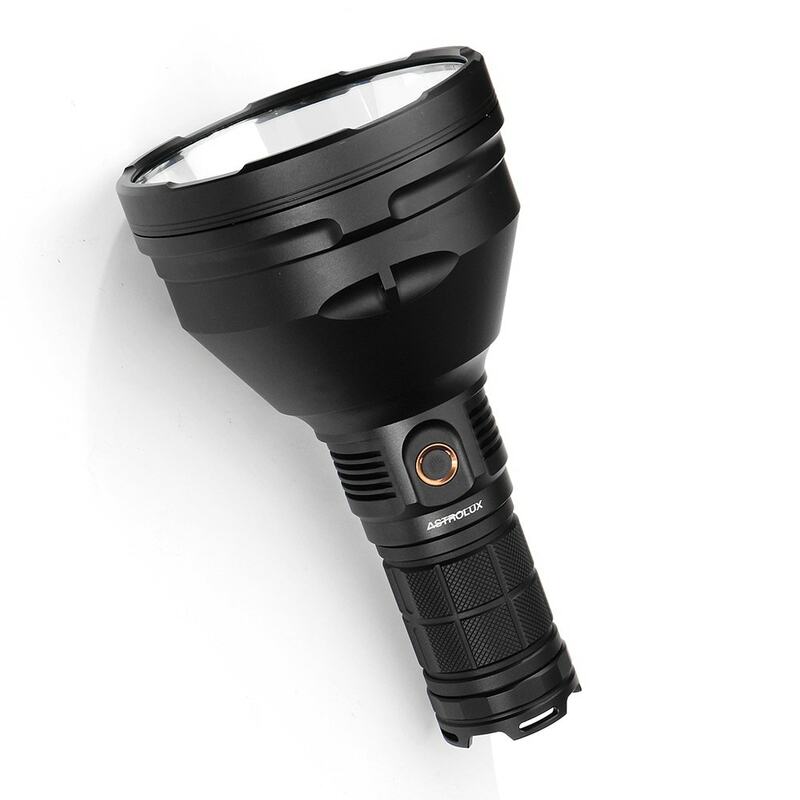 Although the body is much shorter than the BLF GT it does however provide enough grip. Because the head is so big compared to the body, it is a little front-heavy. Depending on how strong your wrists are, this might become a little annoying when using it extensively. The switch is a bit recessed in the body which is a Pro! This means that it is less likely to activate accidentaly. 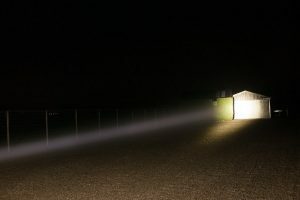 And it also helps to "find" the swith on the feel when in complete darkness. But Astrolux did something differently. 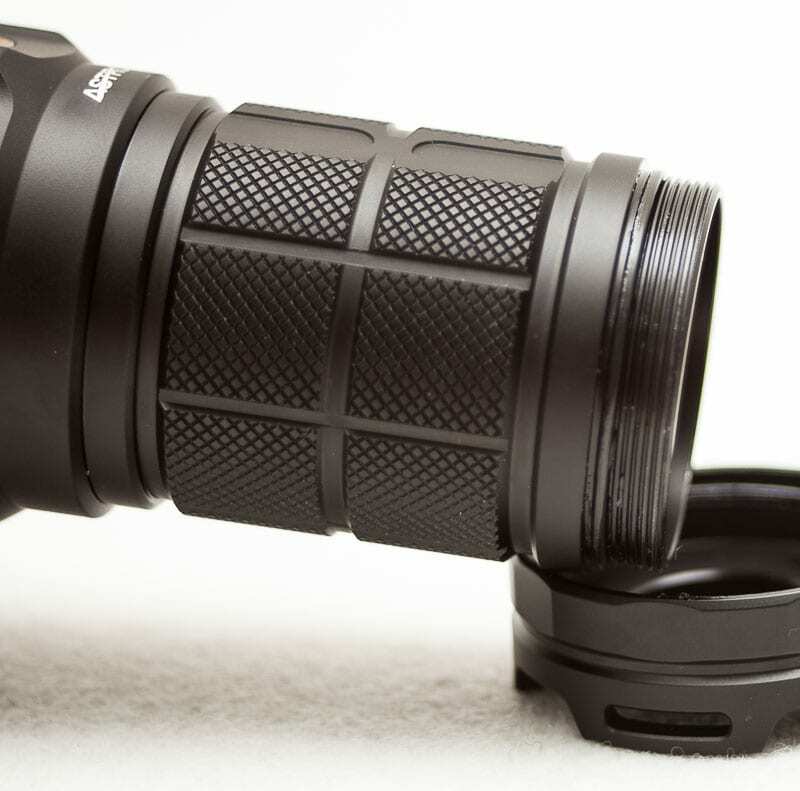 They changed the size of the screw-in tripod mount hole to a larger size so you could use a different kind of tripod. But they also included an attachment in the plastic bag, that makes the tripod hole the regular size. 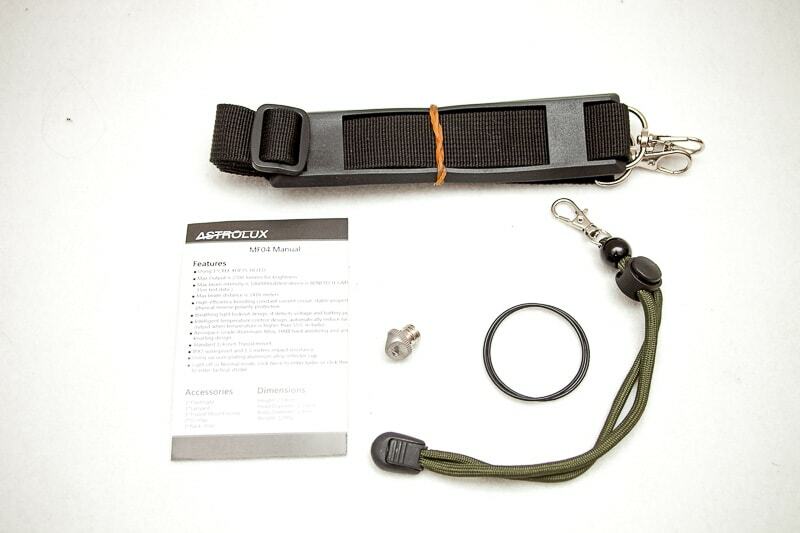 Just notice that this little attachment is actually screwed onto the lanyard attachment. Anodization is the actual coating on the flashlight. 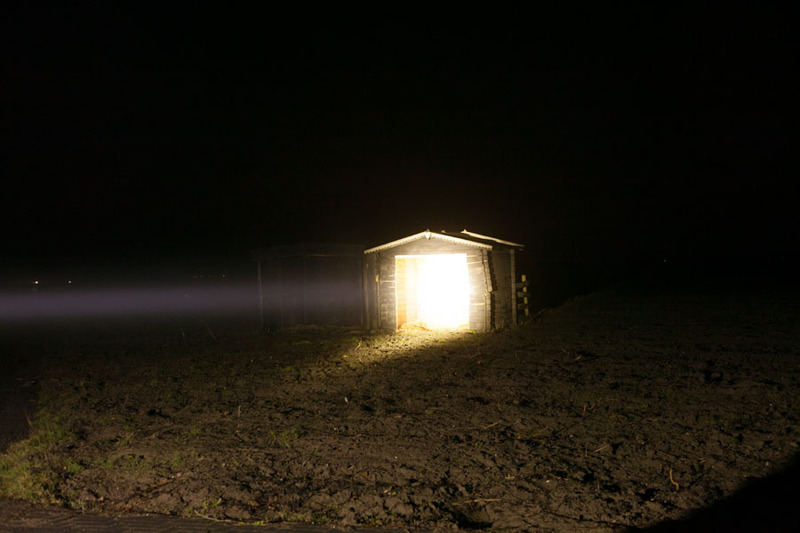 The quality of this particular light is fine. It is however rather sensitive for finger prints etc. 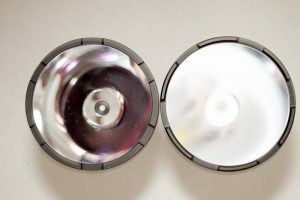 I was lubing the big O-ring behind the front lens element, and touched the head afterwards that left some clear fingerprints. Check the pictures below. For the rest the build quality has nothing to complain about. The bezel was rather easy to take off, and below I will be talking more about the threads etc. The threads came slightly lubed, and werent sharp. The threads between body and head fit well, as well as the threading on the tailcap. Again, this is done professionally without any problems. 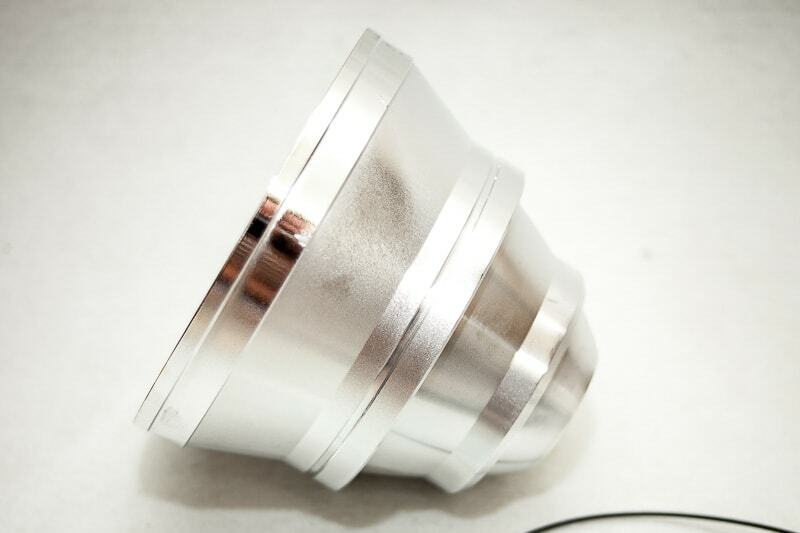 The reflector is made of aluminum and is smooth. But not as smooth as butter :--). If you look up close you can still see some machine-rings. 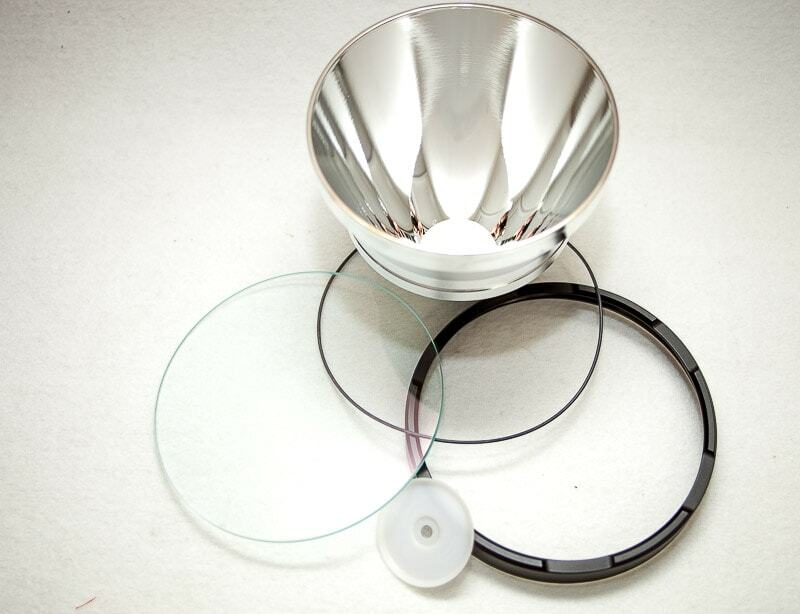 Plastic reflectors tend to be the smoothest. The bezel is of aluminum, and not stainless steel unfortunately: -). This makes it a little less bling.. 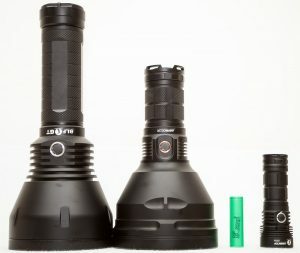 The dimensions are equal to the BLF GT. See the comparison below. 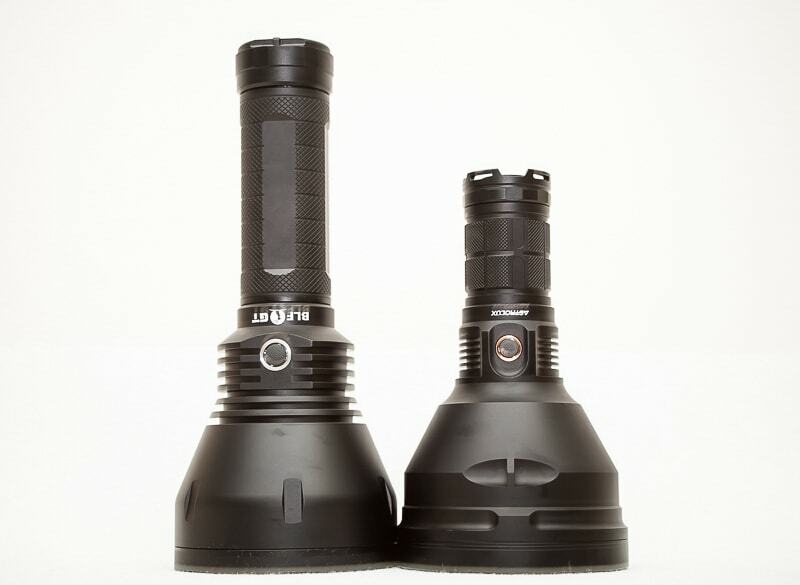 The BLF GT on the left, and the Astrolux MF04 on the right. XHP35-Hi LED for max throw but without having a pencil-type-beam. 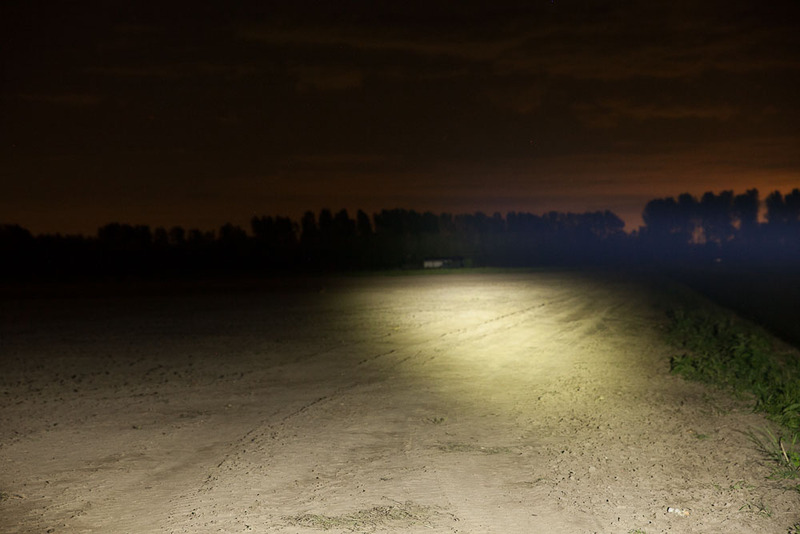 Flashlight manufacturers mainly show dimensions in millimeters. Weight Astrolux MF04 empty: 1290 gr / 2.84 lb. Weight Astrolux MF04- with Samsung Q30*4: 1460 grams / 3.2 lb. 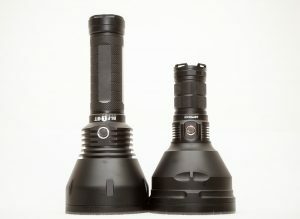 Compared to the BLF GT, the head is the same! So in theory they would "throw" the same as well, unless of course there is a different emitter and driver used..... which there is. Check the pics below for comparion. The battery carrier has a metal construction. 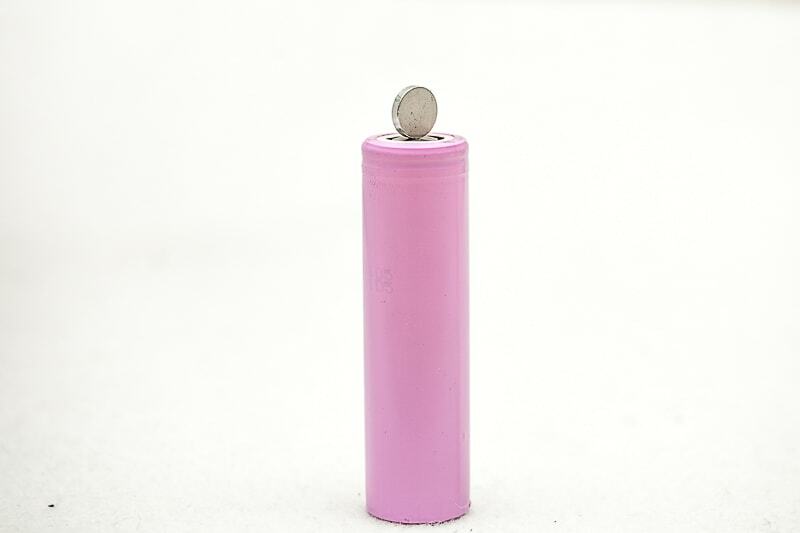 It is best to use high drain, button-top 18650 batteries . 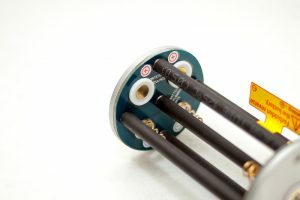 The carrier is designed specifically for buttton tops, and flat tops won't touch the positive pole. 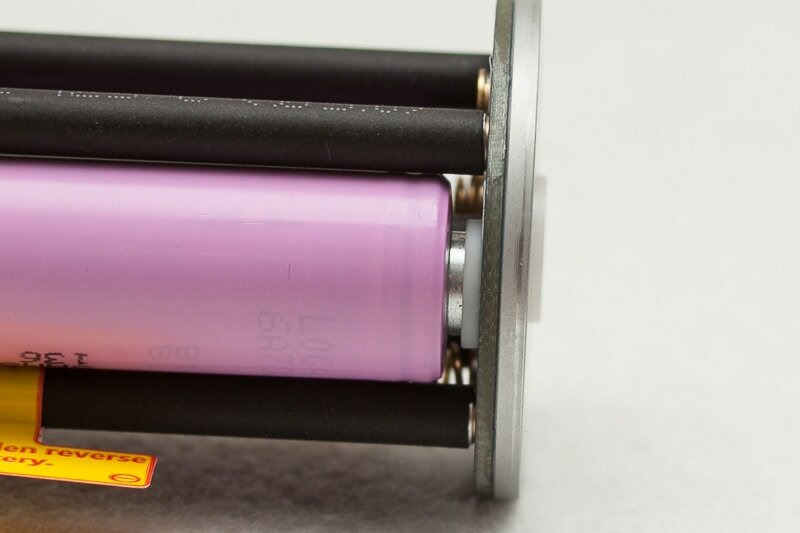 At the positive poles on the battery carrier are plastic rings/washer to prevent from reverse polarity, inserting your batteries the wrong way can cause a short. The good thing is that these little plastic washers are easy to pry off from the protruding button on the carrier. Protected batteries may not fit! My Panasonic NCR18650B's cells with protection do not fit because they are too long for this battery-carrier, but other users say they could use their protected batteries. For sure you can use unprotected cells, and for certain brands also, protected. See the pictures below how this works. One thing to keep in mind, is that it is easy to pry off the washer, but impossible to put back on. LOL. WARNING : this will probably void any warranty! So do this at your own risk! Solution: Another way to use flat-top batteries is by using small magnets. But you need to be very careful because they could end up making a short as well. So I wouldn't recommend this for long-time use, unless you'd solder them to the batteries. There are 2 mode groupt. 1 main, and 1 for the blinkies. The main group has 4 modes,: Moon, Medium, High and Turbo. The second (and hidden) mode group consisnt of a Strobe, SOS and Beacon. A Beacon mode can help save lives.. It will flash at max power for a split second. This extend battery life to max, and you are still able to show your location! SOS could be used as well, but the batteries would run out of juist much quicker. 1 short click: runs through the menu from mMoon to Max. Yes, the MF04 has some blinky modes, and you can enter the blinky menu by clicking 3 times quickly from the OFF position. It will start at Strobe, then with a single click to SOS and Location Beacon. Yet another click will turn the light off again. Press and hold the switch for about 3-4 seconds when the flashlight is turned off. If you use the switch, nothing will happens. Hold it again for 3-4 seconds to return to normal use. Behind the switch cover is a very small LED. This stays on as long as the light is turned off. 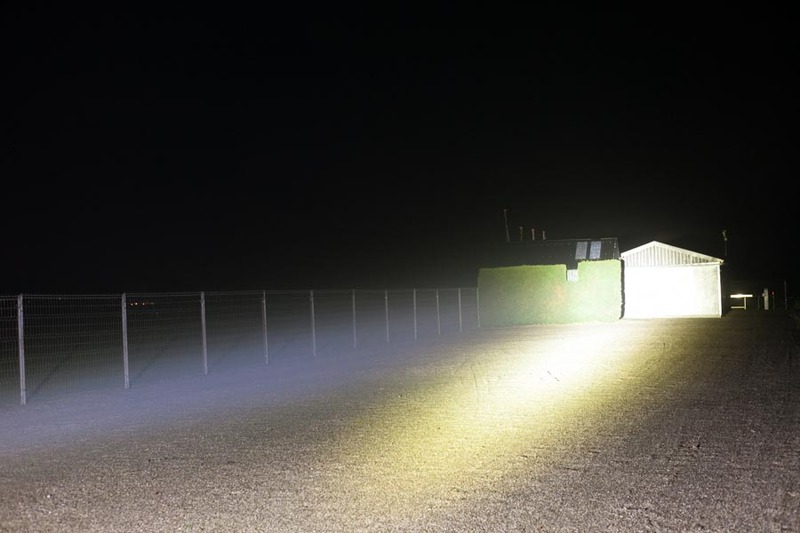 When you do a lock-out, the LED will switch off! This can be handy to save some battery life. Unfortuately I had a very hard time to measure the battery amps. 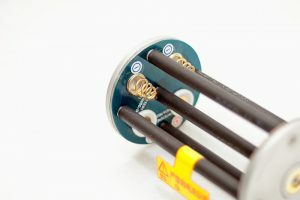 And it is impossible to unsolder 1 LED wire to measure amps, and didn't want to break anything before taking it outside. I think it is more important for this kind of flashilght to measure "throw" and not battery life. 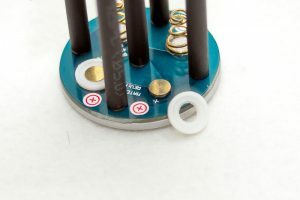 Another thing that you need to keep in mind is that the battery life really depends on a few factors, and not just the mAh a battery is supposed to have. Some batteries will last longer than others while in Turbo mode. So sorry I don't have any numbers here at the moment. 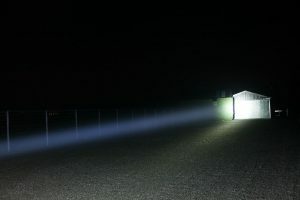 How far can the Astrolux MF04 Throw? I tested them both with the same Samsung Q30 flat top batteries (using the magnet trick I mentioned earlier for the MF04). My measurements always seem to be a little on the lower end compared to others. Astrolux claims a throw of MAX 1460000cd 1.4million candela. Which is almost double of what I measured.. at least at 5 meters. 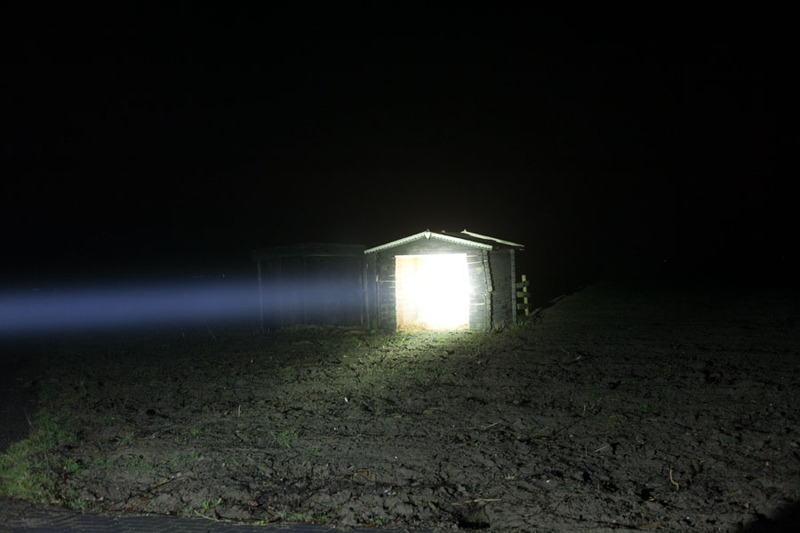 I know measuring at 5 meters for such a flashlight is pointless, but it was the easiest to start off with! Conclusion is that my Astrolux MF04 throws quite a bit farther than the BLF GT! Camera settings for the pictures below: Canon EOS 5D markII 50mm, ISO 1600, F4, 1/4 second shutter speed, 5000K. 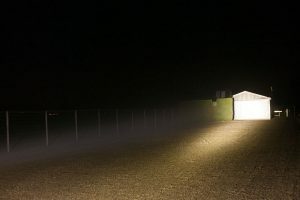 Distance to the shed is about 50 meters (164 feet). Below shots were taking at a winter night with some haze in the air. 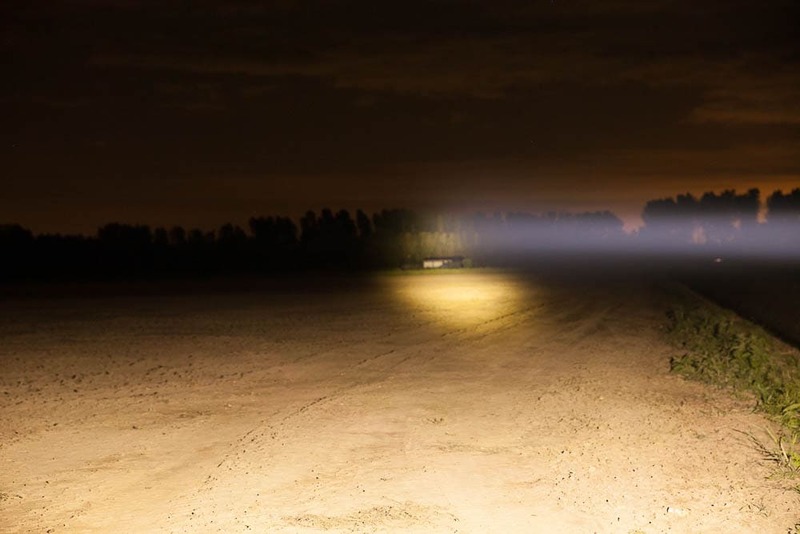 The tower is 650 meters (0.4 miles) away from the camera. The flashlight was about 5 meters away from the camera on the right. Because of the nature of this beast, the light is a little front heavy. So far so good. I have only tested it for functioning, quality and throw, and it's come out very very positive. I must say that I don't have it long enough to say something about the long-time use. If I think I need to downgrade it.. I will do it here. Currently this is the farthest throwing LED flashlight in the world. Where to buy Astrolux MF04? Use coupon code 720f70 for a nice discount.